MapleStory Blitz continues to challenge players, both novice and veteran, with the Grand Battle Update, including an all-new player vs. player (PvP) game mode, Grand Battle celebration event, and more. MapleStory Blitz is the premier competitive trading card game (TCG) rebirth of the classic MapleStory roleplaying game (RPG) from NEXON Korea Corporation, subsidiary of NEXON Co., Ltd. (“Nexon”) (3659.TO), a worldwide leader in free-to-play online and mobile games. 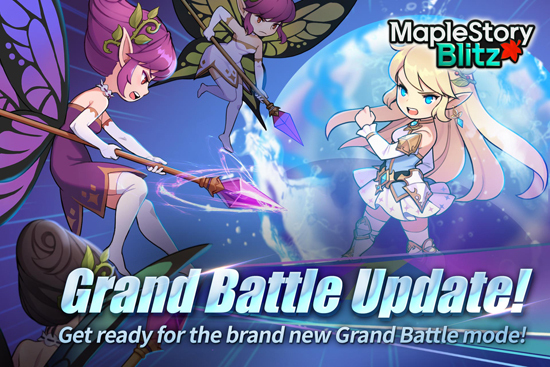 The Grand Battle update goes live today through Wednesday, April 25 for iPhone and Android. Grand Battle Portrait – Awarded for winning 20 times in Grand Battle.